Have you ever had one of those days where you can’t decide what to cook for dinner? Now, I’m not referring to an indecisive evening spent sprawled on the couch, wondering aloud what you COULD make for dinner, all the while silently calculating how long you need to keep up the charade before inevitably ordering pho and spring rolls from that place down the street. I’m talking about a day when you’re instilled with the motivation and desire to cook, but can’t figure out for the life of you what it is that you SHOULD cook. I’m talking about the kind of day when you’ve been dreaming about making steak, but you know that there’s a package of ground turkey lurking on the top shelf, warning you that it’s going to turn if you don’t use it TODAY. The kind of day when you really want to make something with the fresh pasta that you whipped up a few days past, but it’s nice out for once, and a heavy noodle dish just doesn’t seem like it’s in the cards. The kind of day when grilling and hearty comfort food both sound equally appealing. That’s EXACTLY the kind of day it was when I whipped up this recipe. I had the pasta, but I wanted to grill. I had a fresh load of produce from a recent trip to Trader Joe’s. And, of course, the turkey was lurking. My first thought: ground turkey tacos. But that’s a stove-top meal, and a BORING one. My second thought: linguine and meat sauce. Stove again on this one, and the 70 degree weather just didn’t seem to allow for strictly indoor cooking. 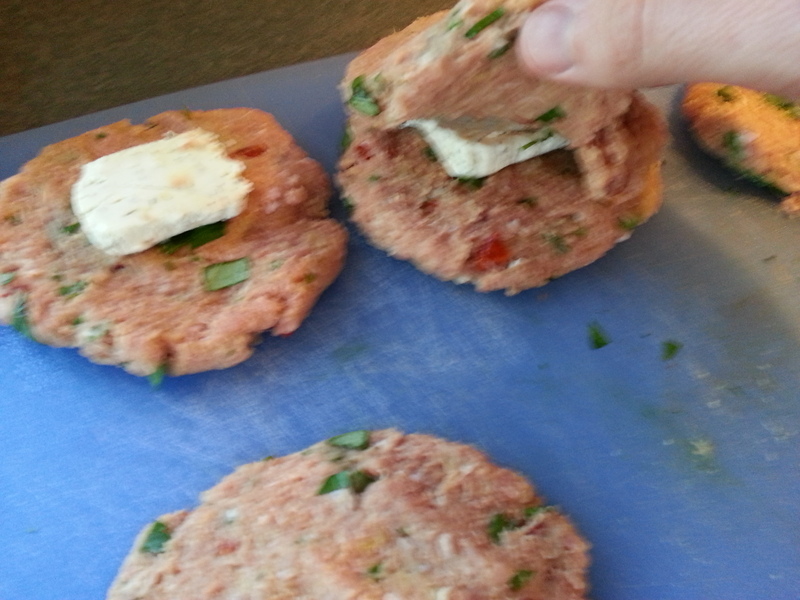 Of course, I could have defaulted to my regular turkey burger recipe, but that’s no fun. I was in the mood to create! So I considered my ingredients. Turkey. Fresh veggies and herbs. Pasta. Goat cheese. Ooohhhh! Goat cheese! Nothing beats a nice herb chevre, especially when it comes together with other savory ingredients in a dish. A light bulb went on. I had been thinking about it all wrong. Perhaps, rather than creating a meal based on turkey, I should start with the goat cheese at the center, like an herbaceous, mouthwatering sun, and build the meal out from the middle. When working with ground turkey, which is an incredibly lean meat, it’s important to add fat to ensure that the burgers don’t dry out. Cheese is a great way to do this, which is why my normal recipe calls for grated parmesan as part of the mix. However were one to simply mix the goat cheese into the turkey, which I’m sure is some sort of culinary faux pas, they would be guilty of heartlessly dissipating a deliciously pastoral treat into an otherwise underwhelming mass of uncooked goo. And then it struck me. Like the aggressive goat – which probably shouldn’t have been in the pen – at the petting zoo. Put it in the center. Stuff the burger with the goat cheese. Make it the gooey, mildly tangy sun at the center of the dinnerverse. That’s when the rest of it fell into place. This is the gooey, comforting, herb-laced result of my internal culinary turmoil. To make the sauce, heat a tablespoon of olive oil in a saucepan over medium heat. Mince the garlic cloves, and brown them lightly in the olive oil, 1-2 minutes. Stir the tomatoes, salt, pepper and italian seasoning into the garlic oil. Simmer the tomato mixture, stirring occasionally, for 20 minutes over medium-low heat. 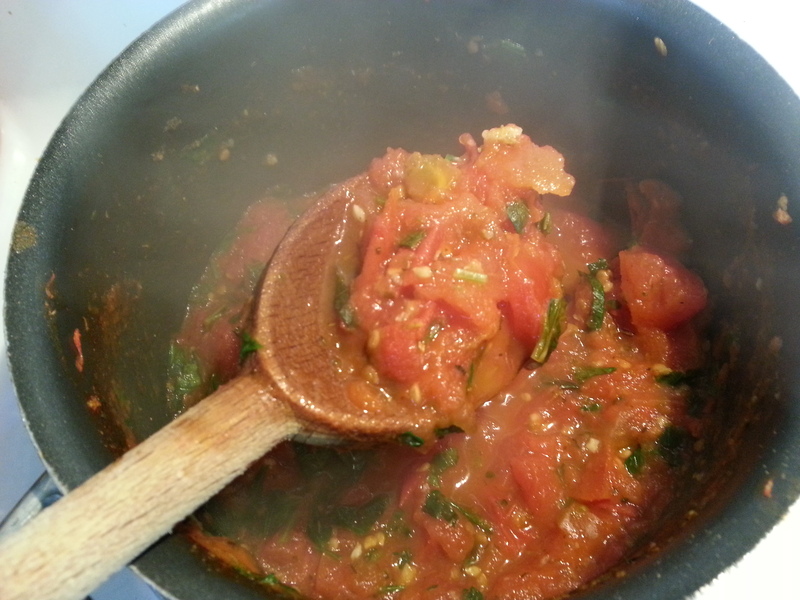 Mix in the basil and parsley, and continue to simmer until the tomatoes reduce. Meanwhile, slice the peppers into three large chunks each, and grill over medium-low heat, skin side down, for 15-20 minutes. Put the peppers into a bowl and cover for 10-15 minutes. 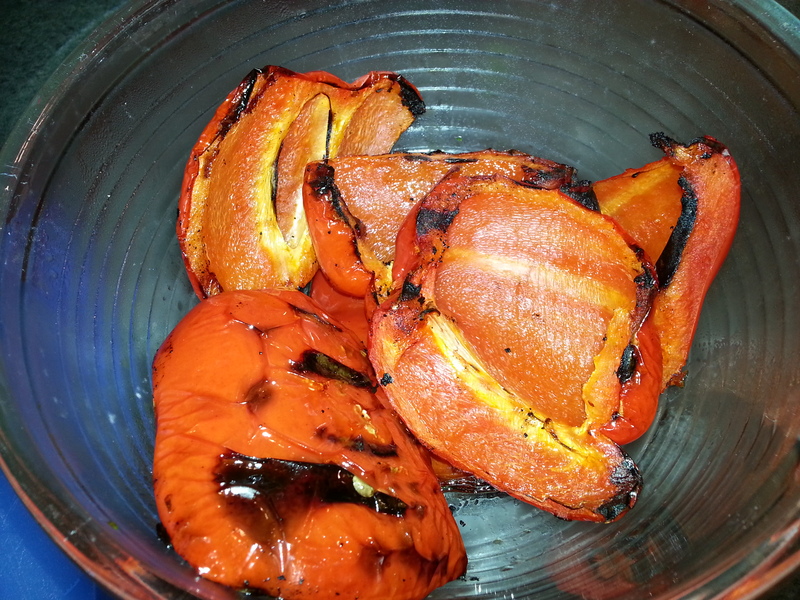 Peel the skin off the peppers, which should be easy after removing them from the bowl. Rough chop the peeled pieces, and fold them into the tomato mixture. To make the burgers, combine all ingredients except the goat cheese in a large bowl. Divide the mixture into six pieces and form into thin patties. To make each burger, place a tablespoon of cheese into the center of one patty, and gently sandwich another patty on top, and lightly press it together. 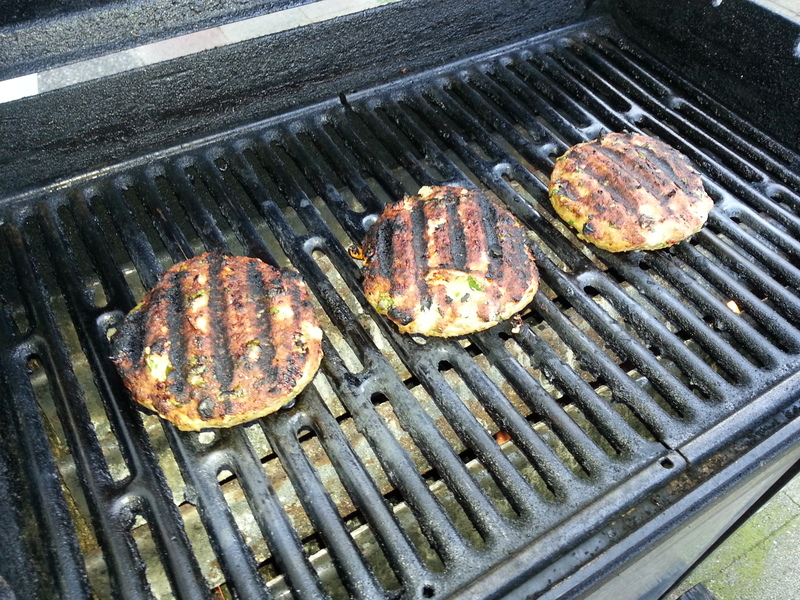 Grill the burgers over medium-high heat, five minutes on each side. 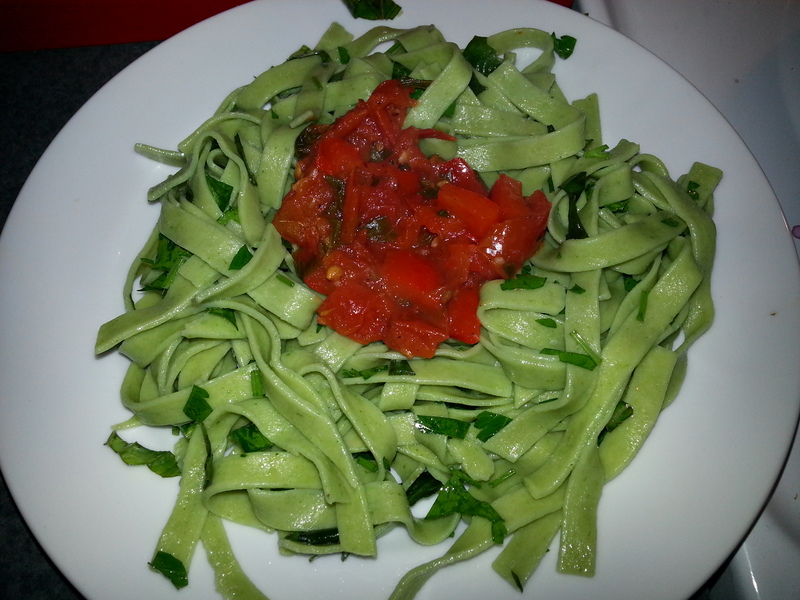 Cook the pasta, drain it and run it under cold water, then toss it with the herbs and olive oil. This dish could be a little tricky to time correctly. Luckily, the tomato sauce can sit on the stovetop on low as you prepare everything else, and it’s okay to serve the pasta close to room temperature, so don’t worry about keeping it perfectly warm. The most important aspect is to make sure that you serve shortly after taking the burger off of the grill so that the goat cheese is nice and gooey when you slice into the meat. 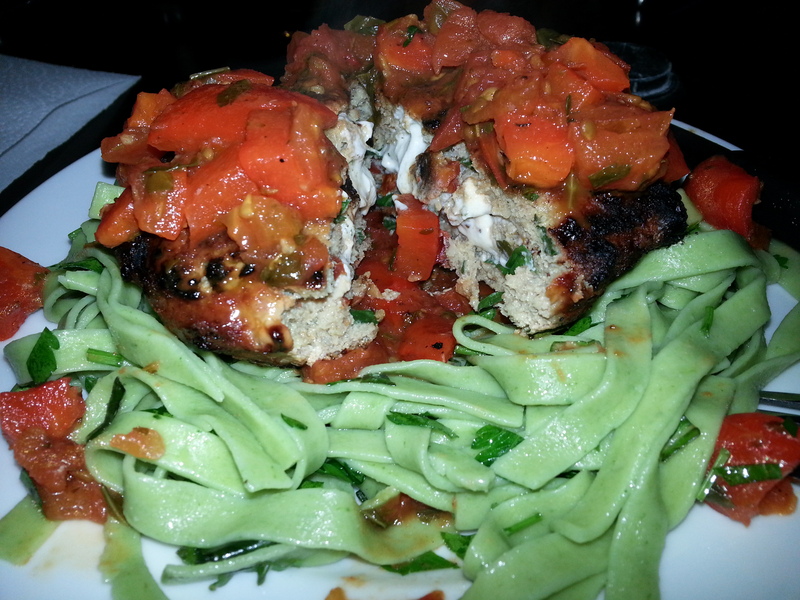 To plate this dish, begin with a neat little “bird’s nest” of pasta, taking care to make a small well in the middle. Place a dollop of the tomato-pepper sauce in the center hollow. 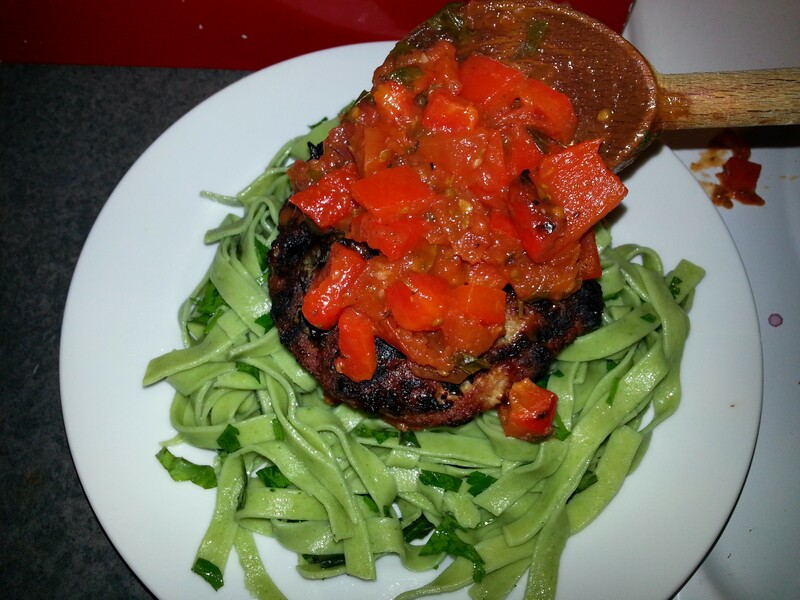 Place the burger on top of the sauce in the center of the pasta,and place another good spoonful of the sauce on top of the burger, and garnish with additional fresh herbs if available. Big ol’ burger – with more sauce, of course!